Cute and engaging: these are the two words that came to mind as I turned pages from the front to back of this wordless picture book. 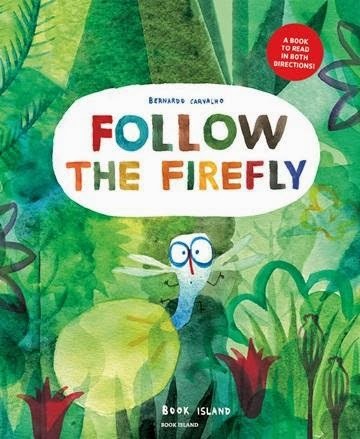 The story, Follow the Firefly, starts with a question, ‘Excuse me, have you seen a flashing light?’ and moves onto a scene of a campfire around which sits a variety of animals. On the right-hand side page is what looks like an electric bulb with a golden end. This is the firefly which moves through the book, from different parts of a forest wherein there are different animals (such as gorillas), and on to a town with busy streets. In the final picture, the firefly has discovered – and fallen in love with – an amber traffic light. But that’s not all, folks! There’s yet another book! Turn the pages from back to front and you follow a rabbit in Run, Rabbit, Run! Doubtless a small child would have noticed what I missed: in every one of the firefly story’s pages, there is a white rabbit. His story can be ‘read’ as well. He leaves the town and returns – pursued by a dog -- to the campfire by the end of his story. I really liked this book! It’s so much fun and it’s sure to be ‘read’ and ‘re-read’ countless times by children aged 2 to 6 years. The artwork is unique and distinctive with Carvalho using full-page vibrant watercolour washes and paintings. There is a real naivety to his animals and especially to his people that put a smile on my face. The pictures of the town are chaotic, compared to those of the various landscapes, which include forest, jungle and wetlands. Book Island is a New Zealand publishing house which describes its company as ‘home to stunning picture books in translation.’ It is wonderful to see books which are so different! Highly recommended.